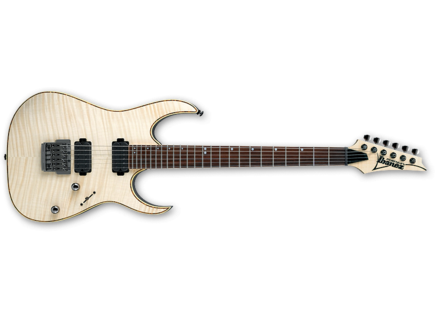 RG721FM, STC-Shaped Guitar from Ibanez in the RG Premium series. First, I’ll mention that I’m not a professional guitarist, so please take this review as that of an average player. I’ve used this guitar in my home studio for composing and demoing (direct in, with no amp). I bought it for that purpose as it had been recommended to me as a guitar suitable to play all kinds of styles (I’ve tried several models in several shops and opted for this one). It is equipped with two humbuckers (bridge and neck positions) and a 5-way switch which allows various combinations to find the adequate sound for the style you’re after. You can play ballads with the first neck pickup, good ol’ funk with the mid switch position and heavy metal using the bridge humbucker. As for how it’s built, I’ll just say erfect (the paint isn’t lacquered though, so beware in case you’d knock it). The finish is flawless, the Ibanez shape and woods used make it an original model, unlike the classic rock guitar models. It’s rather small and light. The neck is a real highway, a real pleasure to play! I bargained it at a good price with a great and sturdy flycase with a velvet interior - a perfect case for a jewel of a guitar.